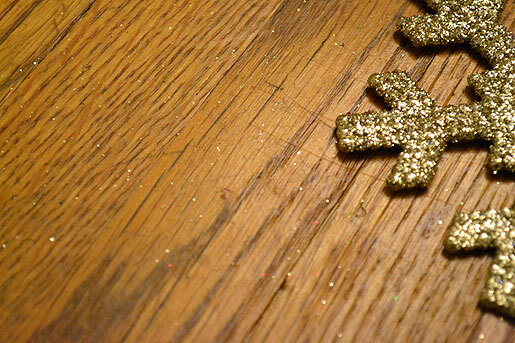 Mid Century Mrs: Glitter Everywhere. Recently, Young House Love posted Forget Mini-Me, Check Out Mini Tree with a great idea on using Target's $1 (double 'pack') ornaments to create a garland type decoration. So, yesterday I just happened to be in Target's Christmas section when I remembered the post and thought that I could totally do something like that for the windows in our living room. We do not really have a ton of Christmas decorations and I try to go through the clearance every year, but we really just have lights, ornaments, and a couple random things to put out. 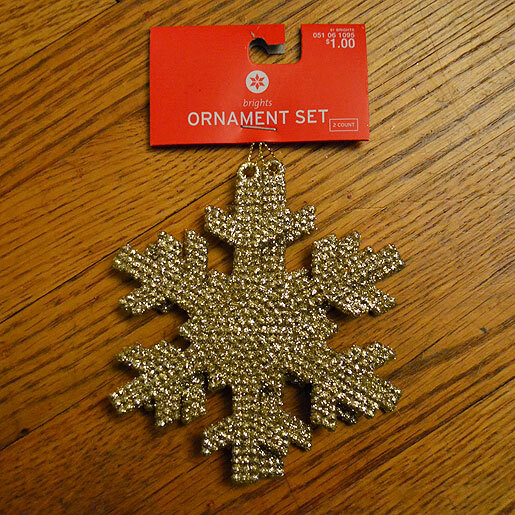 Target's Christmas section is starting to become picked through, so they did not have everything... but I found some snow flakes in gold and red that go great with our color scheme that we already have going on. I bought 3 'sets' of red and 2 of the gold for two windows. My thought process was to do alternating red and gold, using mostly red so it stood out more. 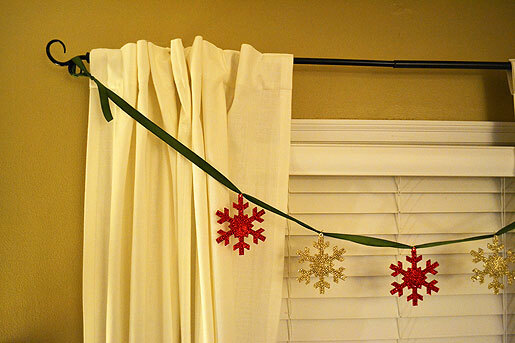 Last year I bought this green ribbon for some other Christmas projects and there was more than enough left to use for both of the windows. I pretty much just guestimated the length, holding it up to the window, giving it some slack so it hung down some and then gave it a bunch more length just in case and to be able to tie it up on the ends. Before I really even started, I had a giant glitter mess. We will be covered, or at least our feet, in glitter for awhile because I'm sure by now we have tracked it everywhere. 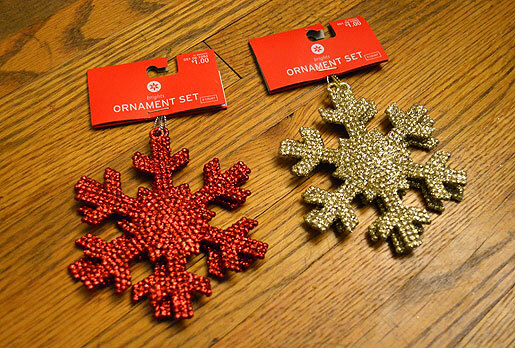 To attach, I just used the string that the ornaments came with. 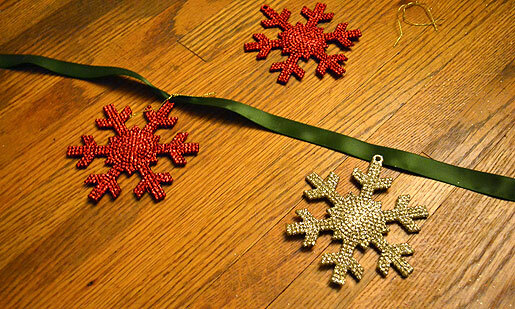 But... because the red ones came with silver, I used the gold that came on the gold ones to attach all of the ornaments. I had to untie the strings and cut up those so there were enough for all 10 ornaments. 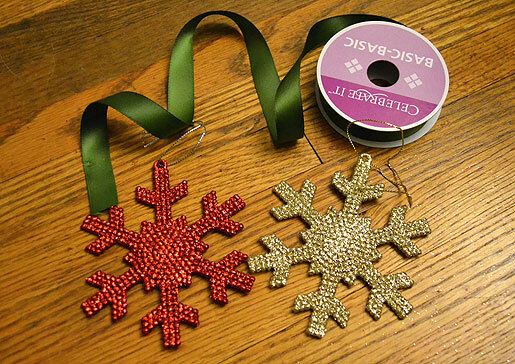 Then I found the center and tied on the first red ornament. I just tied on the ornaments normally, scrunching the ribbon. I knew that if I tried to make it nice and orderly or perfect, I would just go insane. After, I just sort of found a spot where the next ones would look good in terms of spacing. I then folded the ribbon in half at the center ornament to find the other side of the center. Finally, I did the same for the 4th & 5th ornaments. 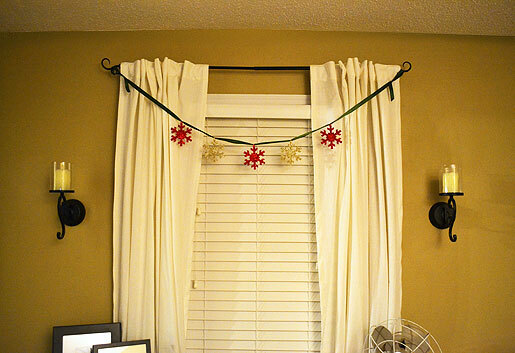 When they were both all done, I tied knots in the ends to hang from the weird curly ends of the curtain rod (they came with the house...). I had to untie and retie due to not enough length the first time. Once I got it figured out, I just matched up the second one to be similar, as both windows are the same size. Super easy and quick. 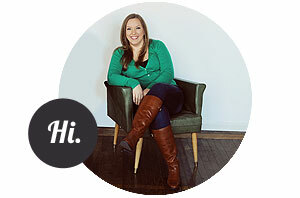 And I think they look great and are easy to use again.